One of the most beautiful Christmas traditions is setting up a creche during the Advent season. A creche is a model of the scene of the manger on the first Christmas at Bethlehem. A creche can be a small model, set up in the home or a large scene set up at a church or lawn. 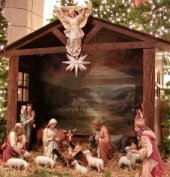 The word crèche is the French word for a manger. Several years ago I was in Paris at Notre Dame. On display in the cathedral was a large creche that features a miniature scene of the village of Bethlehem, pictured below. This extends for about 50 feet, much larger than the small display that typically appears on a tabletop or yard. In Brussels, in the Grand Place, an “actual size” manger display was on display in the city center in front of the Town Hall. The French word comes from the Italian word greccio. Greccio was the town where the first manger scene was set up by St. Francis of Assisi in Italy in 1223. Some say he did this as an alternative for pilgrims wanting to go to Bethlehem, which was then occupied by the Turks. Before that time, many churches had built nativity scenes, but these early mangers were covered with gold, silver, and jewels. They were much fancier than the original manger where the Christ child was laid. By candlelight, they acted out the story of Jesus’ birth. St. Francis hoped that this would encourage people to remember the gift of God to men as the child born in a manger, and not all the materialistic gifts exchanged. Three hundred years later, Martin Luther had his children open their presents on Christmas Eve, to keep Christmas Day itself special to remember the Christ child. What day do you open Christmas presents?